Meritor Inc. has announced the launch of its ReadySet No-Ream King Pin Kits on MeritorPartsXpress.com (MPX) to help customers more easily find a king pin kit for major axle applications. Meritor says ReadySet with pre-sized bushings is ideal for linehaul, vocational, city delivery and bus applications. The kit is offered under the Meritor aftermarket brand and fits a range of axle applications from Meritor, Dana, Eaton, Spicer and Ford. The no-ream bushing is a cost-effective option that saves labor over conventional bushing kits that require reaming and is easily installed, according to the company. With the addition of the ReadySet line to Meritor’s king pin portfolio, Meritor now has a complete offering that meets multiple price point requirements and covers 95 percent of the market for ream and no-ream applications. ReadySet king pin kits are covered by Meritor’s standard one-year aftermarket warranty and are backed by extensive customer support, the company says. Meritor says it wants to make it easier for customers to identify and purchase king pins by adding Xact Search functionality to MPX. 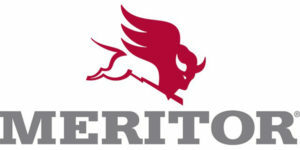 Previously, customers had to know which kit fit their application or would have to call Meritor for technical assistance. Now, customers can identify the right king pin by entering make, model, year and axle manufacturer into the search fields and will see all Meritor’s kits with different bushing offerings for the axle regardless of original manufacturer.